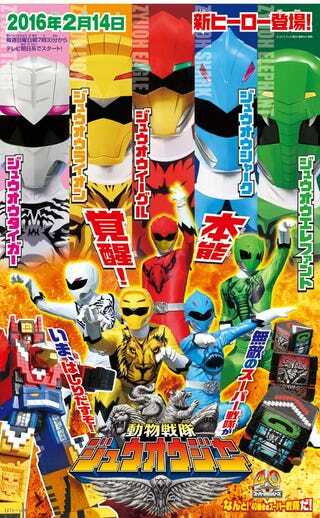 Super Sentai's 40th Anniversary show: Zyuohger!! Toei’s other popular franchise has reached a milestone celebration! Maybe Bashcraft could report on it later in 2016! Four human-animal aliens from the planet Zyuland escape an invasion orchestrated by the Deathgaliens. On earth, these aliens meet up with human biologist Yamato Kazakiri and form up a team of Animal-themed Power Rangers!! But the main point of this show is: get those Minecraft-addicted Japanese kids to watch this show!! All of the Robots in this show are primarly box-shaped toys that can transform into their animal modes!! And can grow into megazords!! Gundam Versus, newest entry of Mobile Suit Gundam&apos;s fighting game series, will be coming to the West this Fall 2017! !